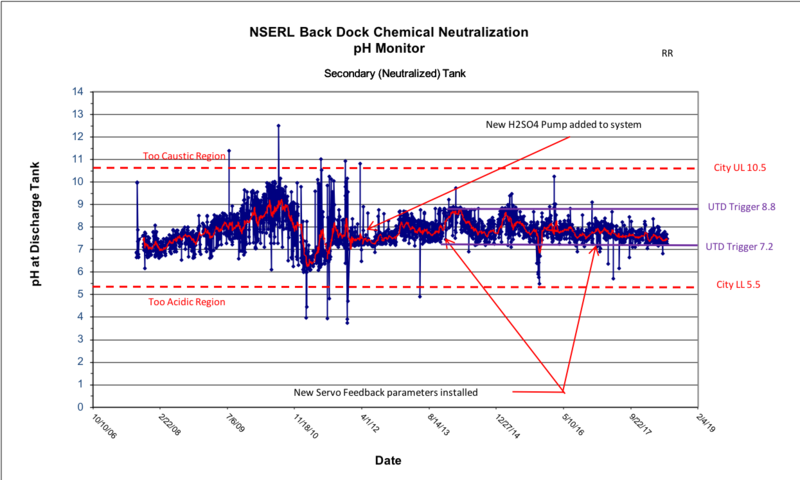 NOTE: This graph charts the pH level of the water leaving the active chemical drain neutralization system from the NSERL Cleanrom laboratory on the UTD campus. The servo deadband is shown by Purple UL and LL boundary lines. We found that the shifting experimental chemistries caused the discharge pH to singificantly drift up and down over time. In 2016 we reset the pH Neutralizing servo parameters to avoid self oscillation and minimize overshooting the city limits via short term spikes from unexpected large user dumps of very low pH chemicals. The pH measures the acidity of the water leaving this system and entering the Richardson City sanatary sewer. REF: pH=7 is Neutral, pH<7 is acidic, pH>7 is basic (caustic) pH is monitored daily. NOTE: The fluid discharge rate from the lab is on the order of 2 gallons per minute of city water used to flush chemicals. The Chemical discharge volume is highly variable but is estimated to be less than 2 or 3 gallons per day.